Anyone want a dog? Because I have one that I'd like to get off my hands. Wait, I don't mean that. Well, maybe a little. You see, I'm somewhat conflicted. Early on in the life of this blog, I mentioned that I'm not one of those pet owners that considers my dog to be equal to my children in terms of importance. However, I love him and certainly wouldn't wish any harm to come to him. Oscar, while loving and unfailingly devoted, often drives me crazy with his perseverance. (Sound familiar?) If he wants to go outside, he will whine at the door without so much as a breath of silence regardless of how busy I am or otherwise unable to help him at a moment's notice. If he wants to eat, he will follow me around and claw at the back of my ankles and twist around underfoot until I trip over him and he starts whining again. So when Oscar discovered that he could use the retaining wall like stairs to access the planter bed in our backyard, I wasn't surprised that he was constantly rooting around and peeing on what were once my best flowers. I tried for months to keep him out of there, but he persevered with his quest until I gave up and let him sneak around the overgrown flowerbed as if he were on a poor-quality jungle safari. Last week, my family was sitting in the backyard, letting Oscar and my sister's dog, Gus, chase each other through our revitalized grass, when we heard a high-pitched squealing. At first I thought it was a squeaky toy, but upon remembering that we didn't own one, my heart sank. We chased the dog from the planter and reluctantly pulled back the leaves of my black-eyed susan to find four tiny baby bunnies-- eyes still closed, and amazingly unharmed. The next day, when my dog, the least preditorial canine I know, manhandled another bunny while he was supposed to be peeing, I ran outside and scooped up the tiny bunny without thinking and barely contained myself from raging on the mutt. I knew it was an instinctual response and truly not his fault, but as I held the tiny rabbit in the palm of my hand, I felt myself get attached. Hard. Operation Oscar Lock-Down was officially in full force. I began taking the dog out to pee in the front yard on a leash. I did a bunch of internet research to make sure it was okay for me to handle the bunny babies and not do anything that would lead the mother to abandon them. When I knew it was okay, I held them all. I took pictures of each of them. I took pictures of myself with each of them. I counted tiny toes and miniature white tails. I nearly forgot that I owned a dog. Until Wednesday night, when we went out for pizza and came home to find that the dog had accidentally been left outside for almost three hours. My heart sank even further. I quickly ran to the bunnies' hutch only to find it completely empty. 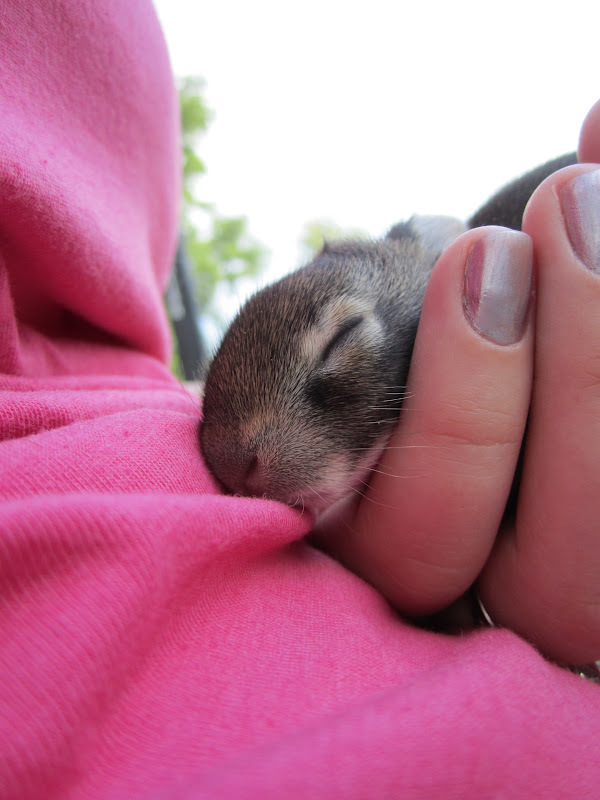 All four bunnies had grown and could hop a bit, but were not mobile enough to escape if a predator invaded their home. But there was no blood or tufts of misplaced fur, so I kept my fingers crossed and surveyed the yard. When I found nothing, I figured that the rabbits had miraculously evaded my furry white tyrant, and I let Oscar resume his backyard gallivanting. And gallivant he did, right over to the corner of the yard where he resumed munching on the carcass of one of my newest and furriest friends. I could have killed him, and was tempted to do so in a manner similar to his preferred method. I couldn't bury the rabbit bones, because Oscar would unearth it in a matter of moments, and I couldn't leave the messy remains there for fear that one of the kids would find it. So I did the only other thing I could do, and grabbed a plastic bag to unceremoniously dump it in the trash. The whole event turned my stomach and broke my heart. I felt that it was my own mistake for not double-checking Oscar's whereabouts before leaving the house. I couldn't feel worse. Until I found him shredding another tiny body on the west side of my lawn.